Why use chemicals designed for scrubbers? When cleaning with a scrubber, we strongly recommend using only floor cleaning chemicals that are designed for scrubbers. Our line of chemicals significantly reduces corrosion of scrubber parts (although, really, you ought to have stainless steel parts anyway), as well as foaming in the solution tank. This means that you’ll be extending the life of your scrubber and minimizing the risk of foam getting into the vacuum motor by allowing your scrubber’s float assembly to function properly. Tip: To further reduce foaming in the solution tank, fill the tank with water first, then add the cleaning chemical. Also, thoroughly rinse and clean residue from the solution tank after completing your cleaning job. 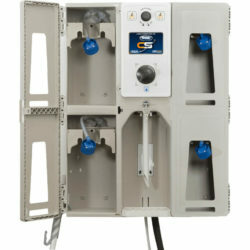 This is a complete cleaning solution system with the ability to fit up to four different cleaning products inside. Easily alternate between chemicals and automatically dilute as desired at the touch of a button. The middle section of the model also connects directly to a water line if you need to simply fill something with water. 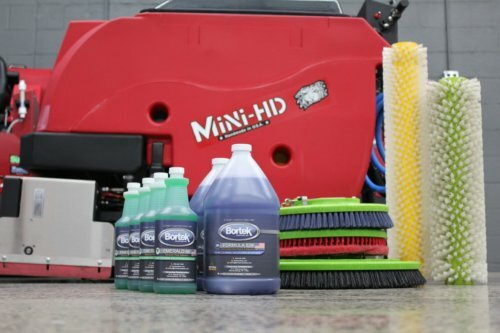 The quad model is a huge time and money saver to simplify your cleaning program. 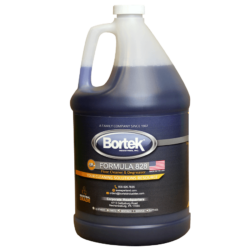 It is also compatible with a full line of other Bortek chemical products. A nonflammable concentrated cleaner & degreaser for use on medium to heavy industrial soils on machinery, floors, walls, and more. 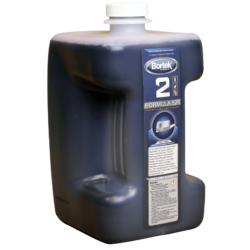 A water-based cleaner and degreaser, formulated to remove grease, oil, carbon or any other industrial soil. 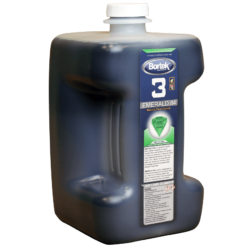 Formula 828 is an extremely effective floor degreaser and cleaner. It’s a unique blend of saponifying agents (agents that essentially turn fats/oils into soap) designed to instantly emulsify grease and oily soil. Over time, using Formula 828 on concrete flooring will also ensure it remains bright and beautiful, furthering the attractiveness and professionalism of your facility.